Voice guided message confirms the acceptance and rejection of the punching. The Bio-Link features a recording capacity of 2 lacs records. It has multiple communication mode that allows the user to get the data easily without any hassle. The Bio-Link can store 600 finger templates making it more useful for small & medium set-ups. It features a graphic LCD display that displays the message where as the voice guided message confirms the status of attendance. A Home Edition Software comes with the Bio-Link to maintain the attendance records. Voice guided message in any English/Hindi. 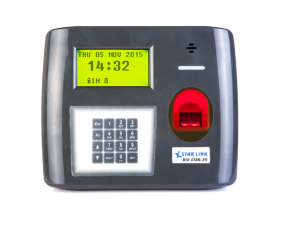 Time Attendances, Access Control, Payroll.